Owing to the large number of issues touched upon in Edward Said’s Orientalism, I have chosen to focus on three key aspects of his thesis: Imperialism, Identity and Orientalist study, before discussing the presence, or otherwise, of an Orientalist hegemonic discourse in Mozart’s Die Entführung aus dem Serail. Although Western ‘Imperialism’, per se, is not directly relevant to the context in which the work was written, since the Ottoman Empire was not occupied by a European nation at all between 1389 and 1914, political relationships between Vienna and the Ottoman Empire inform the depiction of both Eastern and Western characters in this opera. In looking at Identity, I shall discuss the portrayal of ‘Self’ and ‘Other’, especially in relation to Enlightenment ideology. Orientalist scholarship itself had much less influence over Die Entführung than over Verdi’s Aida, for example, yet the related question of cultural authenticity is integral to analysis of how the Turkish topos is represented. The Ottoman Empire was a significant threat to European power throughout the Early Modern period. The Fall of Constantinople in 1453, and the 1683 siege of Vienna, contributed to fear of the ‘barbaric Turk’, whose military power remained considerable in 1782, the date of composition of Die Entführung. There were also battles between the Russians and the Ottomans in 1768-74 and 1787-92, although these were mainly in reaction to Russian aggression. The Ottoman Empire did not collapse completely until the early twentieth century, when Turkish politics were secularised to fit a European model. From the Viennese perspective in 1782, the Turk was viewed as a potential threat, but one that had, for the time being, been pacified and could now be ‘domesticated’ through the medium of the alla turca style.1 There are many ways to interpret the way in which Turks were depicted in Western art-music: is the gesture is triumphant or conciliatory, xenophobic or cosmopolitan? Mary Hunter has shown that the alla turca topic was only used in Western art music while the Ottoman Empire still constituted a threat, whether imagined or actual.2 Therefore, in composing a Turkenoper, Mozart was reacting, in part, to a political actuality, although the discourse was not necessarily weighted entirely in favour of the European power. This was not a depiction of a vanquished people but of a potential menace. 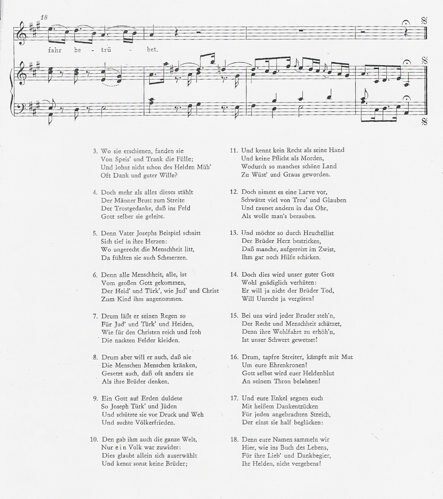 A more overt example of Mozart’s participation in political discourse is his collaboration in the composition of the ‘Lied beim Auszug in das Feld’, a song which was published in 1788 in a children’s magazine to encourage support for an unpopular war, waged by Emperor Joseph II against the Turks. The text describes the war as “both a necessary and honourable intervention against the injustices perpetrated by bellicose Turks”3 and was endorsed by the Emperor owing to the Viennese alliance with the Russians, whose territories in the Balkan States had been invaded. In the depiction of Others in opera, the balance of power is often skewed towards a European dominance by placing the subject in opposition to the Self through various different means. It is common to antiquate the Other, yet there is no reason to believe that Die Entführung is not set in the eighteenth century. The Other is also often portrayed as politically weak but the actual threat of the Ottoman Empire to the Hapsburgs, and the fact that Pasha Selim is ostensibly the most powerful character in Die Entführung, complicates this balance. Moreover, the Other was often portrayed as a ‘noble savage’ living in a utopia onto which the West could project its unfulfilled fantasies of a pure existence closer to nature. The Ottoman Empire, on the other hand, was a civilisation which matched its European equivalents in sophistication. Therefore, the Turk in Die Entführung is as much a Self as an Other, existing in the same century, able to exert comparable military force and, presumably, equally ‘corrupt’ in the vices of the modern world. Moreover, the Ottoman Empire also shared its roots with European powers as both were built on the remains of the Roman Empire. Within the realms of Western music, however, the alla turca topic represented the Turk as a barbaric inferior. Based, as it was, purely on the music of the Janissary bands, its military content served to reinforce the idea of the cruel and bellicose savage. 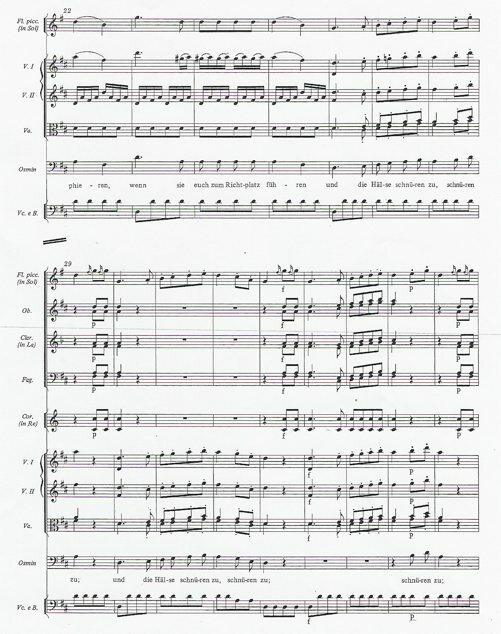 Furthermore, the alla turca exhibits a high level of repetition, simple harmonic progressions and almost folk-like simplicity at times.4 The use of the sharpened fourth, and other chromatic elements, often implies a ‘wrong-note exoticism’ which serves merely to belittle its subject. In this corruption of conventional classical syntax the Turk is shown to be inferior and incapable of expressing himself through the medium of high art music. 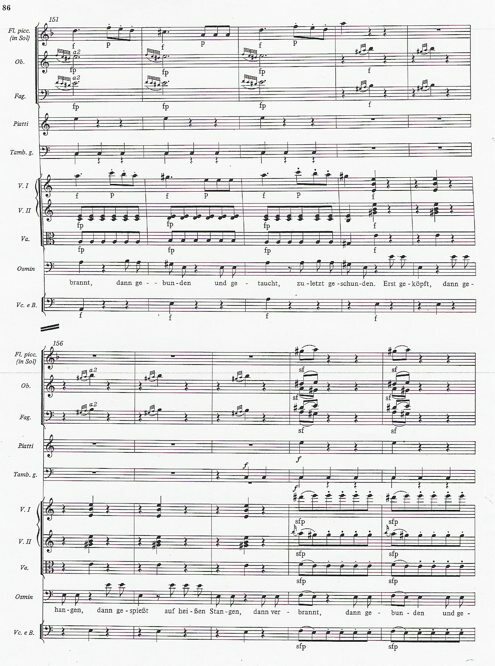 The alla turca topic in Die Entführung is most obvious in the Overture and the two Janissary choruses (Act I, Scene 6, No. 5b and Act III, Final Scene, No. 21b). 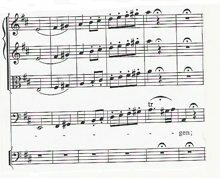 The repeated quavers in the accompaniment, échappé notes, acciaccaturas, use of percussion, long notes followed by shorter ones (see Figure 2, bb. 10–13), sharpened fourths, and the C major tonality are all typical. 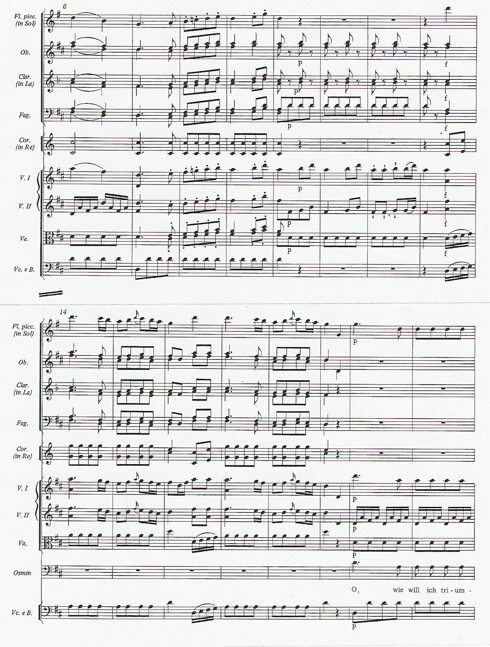 Said has commented that Mozart’s ‘Orientalism’, in Die Entführung, was more benign than Verdi’s in Aida, for example, because Verdi’s opera was based more explicitly on scientific Orientalist research, and would, therefore, indirectly claim a false authenticity.6 In Die Entführung, Mozart would seem, from his comment above, to be writing within conventions of depicting the East in opera, purely to entertain his Western audience, rather than attempting any objective ‘truth’. The inclusion of female voices in the Janissary choruses, which, as military music, would have originally have been sung by men only, also implies that Mozart was not particularly concerned with authenticity. 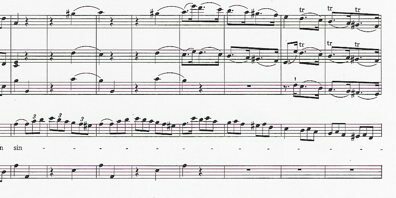 The grotesque melisma on ‘singen’, at bars 112–25, seems to exaggerate the rather gruesome nature of his delight at the barbaric punishments he wishes upon the prisoners. Using ‘Turkish’ music for Osmin’s rage would set him apart as an Other, just as much as other aspects of his character would enable the upper-class and ‘rational’ Enlightenment audience to place themselves in opposition to him, and perhaps to codify their sense of self as his antithesis. His delight in torture is in direct opposition to the ‘modern’ principles of reason and justice to which the audience may have aspired. Indeed, Emperor Joseph II banned torture and the death penalty in 1781. Enlightenment philosophy is often summarised as prizing reason and individuality over tradition. A spirit of tolerance pervades many of the writings of this period, yet it can frequently descend into xenophobic jibing. In the ‘Lied beim Auszug in das Feld’, the text begins with “God cares for all nations, including Jews, Turks and heathens” but since the Turks will not be bound by God’s benevolence, and since God “certainly wants to correct injustice”, Austria is justified in its aggression against the Ottoman Empire.12 The anthropological creed of ‘civilisation versus barbarism’, while functioning as a maxim in the West, also enables the audience to perceive themselves as superior to Osmin and, by extension, any Turks of a similar description. The depiction of Pasha Selim, however, conflicts with conventional notions of the ‘barbaric Turk’. He owns a harem and slaves and, in many other respects, fulfils the criteria of the ‘Oriental despot’. His characterisation, as a speaking part, is difficult to compare with that of other roles. It is possible to surmise that, by not singing, he enhances his ‘noble’ character, or that, as a despot, music is beyond his reach.13 When he falls in love with Constanze, he tried to woo her through various means. After her first refusal, he threatens her, albeit indirectly; but, when she remains resolute, he attempts to win her through reason. His ‘natural violence’ seems to diminish when he loves a Western woman, and he promises to love her alone, as his “Einzige Schätze”, thus renouncing his polygamous rights in the harem. When he is betrayed, at the end, and discovers the attempted elopement, he sets the Westerners free, despite the fact that Belmonte is the son of his enemy, Lostados, the Commandant of Oran, who deprived him of everything he had. The secularism of Enlightenment theories may have encouraged a more open mind towards other cultures and religions. It is possible that, by portraying the Pasha’s clemency, Mozart is providing an example of a ‘good Muslim’ to shame the Christian audience, which Thomas Bauman describes as a common ploy with the “leading writers of the Enlightenment”.14 He could, alternatively, be congratulating the East on its ‘Christian conduct’, a rather more patronising interpretation. However, Pasha Selim was not born in the East and is, in fact, an apostate. It would therefore be possible to attribute all his admirable characteristics to his Western origins. The link between the Pasha and Belmonte further complicates the causality of the former’s behaviour. In Bretzner’s original play, on which Gottlieb’s libretto was based, the Pasha is actually Belmonte’s father, and not Lostados’ arch-enemy. Mozart and Gottlieb collaborated in this alteration of the plot, presumably to heighten the dramatic reconciliation at the opera’s close. The depiction of love in Die Entführung also confounds a straightforward polarity between East and West. When Belmonte and Pedrillo meet their lovers, prior to their recapture, they ask whether the women have remained constant. Blonde and Constanze are enraged and the men reply that “When women are aggrieved/ Because we think them fickle,/ Then they are really true/ And free from all reproaches”.15 Thus, although the Western women have not succumbed to the charms of the East, Belmonte and Pedrillo were conscious that they may have done. The notion of the Eastern man proving more appealing to the Western woman is also explored in Così fan tutte. When Ferrando and Guglielmo, disguised as Albanians, present themselves to their fiancées, they are aggrieved to find the women more intrigued than they might have hoped. The Oriental man is often portrayed as being sexually licentious, violent and cruel.16 He practises coercion and lascivious polygamy, whereas his Western counterpart values free-will and romantic monogamy.17 Osmin’s attempts to force Blonde to love him result in her ridicule, and he later criticises the folly of the Englishman in allowing his women so much freedom. Pasha Selim, as representative of a more Western style of wooing, realises that forcing love cannot work and, once persuasion has also failed, he tells Osmin, in the dialogue prior to No.21a at the end of the opera, to calm himself, as one has “to get rid of” those “whom one cannot win over by kindness”. There are many reasons why Mozart may have chosen an Oriental subject, not all of which are ideologically loaded. 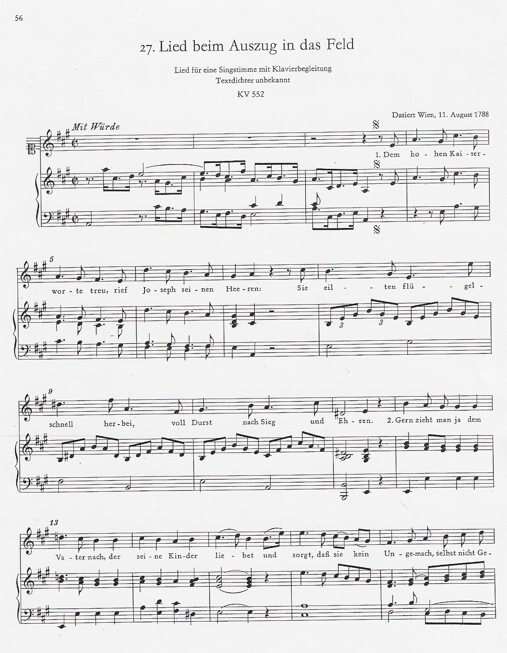 Exoticism in music was appealing to audiences, and the Turkish idiom was popular in Vienna.21 Using an Eastern ‘backdrop’ contextualises the social and gender relationships within, while enabling a more complex and elusive discourse. 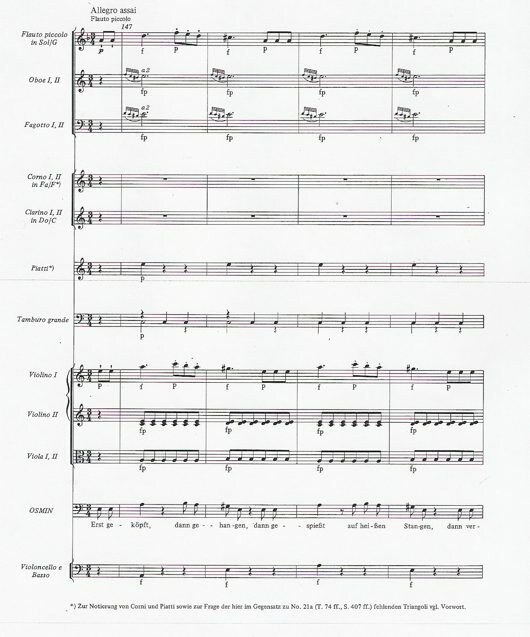 The alla turca is portrayed through means which were very much part of the Western classical tradition, although the addition of percussion constitutes a more ‘authentic’ gesture. The fact that the alla turca is so ‘inauthentic’, in relation to the music of real Janissary bands, may be due to the necessary translation to make it comprehensible to Western ears. Certain elements, such as the emphasis on ‘wrong-note’ exoticism, may imply an element of mockery. However, the use of exoticism, especially in opera, is often an attempt to “mythologise or universalise aspects of human behaviour”.22 Osmin, evidently, cannot be interpreted as a wholly disinterested representation of a Turk, yet, as a comic character, he shares many characteristics with Western buffoons in other works. Pasha Selim, however, may be better understood as an example of generalised ideal human conduct. His liminal state, as an Eastern despot of Western origin, enables him to stand outside the sphere of absolute categorisation. The depiction, in Die Entführung, of the East as ideologically less advanced than the West, with its oppression of women, delight in torture, and ‘barbaric’ religion, fits with stereotypes found in other ‘Turkish’ operas of the time. The fact that women actually had more freedom in Turkey in the eighteenth century, and were even involved in politics, shows that the Western interpretation was far from accurate.23 Alla turca, based, as it was, solely on the military music of the Janissary bands, hardly constitutes a faithful representation of Turkish music as a whole. 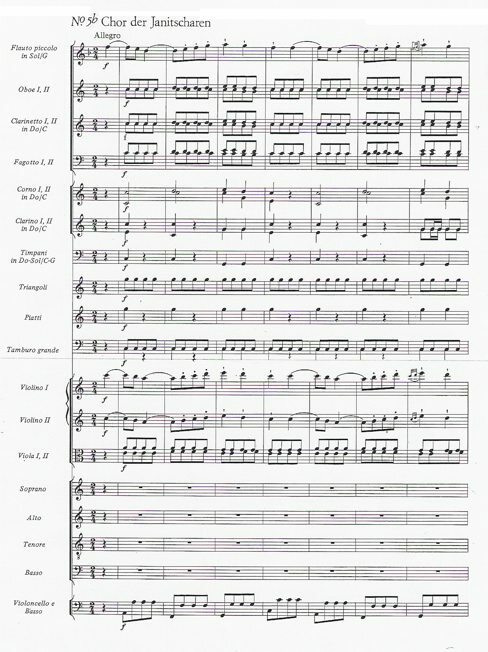 The use of a plot stereotype implies that Mozart was prepared to exercise his dramatic creativity within a framework of conventions, and that he did not intend to depict the Turk as he ‘really’ was.24 It appears that Die Entführung essentialises on a grand scale, yet, for any text intended for mass readership, especially in the context of entertainment, this is almost impossible to avoid. Within the boundaries of Saidean Orientalism, a work is deemed more ‘Orientalist’ if it purports to be authentic. 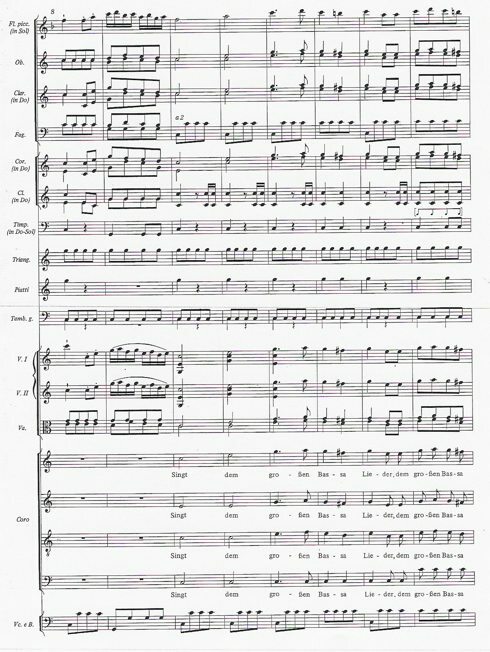 Mozart’s Die Entführung aus dem Serail makes few, if any, claims to authenticity, most significantly because in theatre the boundary between what is ‘real’ and what is ‘imagined’, what is literal or ironic, is difficult to define. In a sense, the onus of ideological responsibility is shifted from the work itself onto the audience, and the way in which they perceive it. Moreover, in the blurring between Self and Other, Die Entführung does not provide a clearly Oriental identity, against which the Westerner may posit their notion of Self. The work is clearly of Orientalism, as Said states of Aida, since there are allusions to the East within a discourse of power, political or otherwise, yet this could be said of so many disparate works that it is an ultimately useless conclusion. The negative stereotypes of the East in Die Entführung clearly portray it in a way which would reinforce the West’s perception of its own superiority. However, in order to satisfy Said’s contextual conception of an Orientalist work there must be a hegemonic discourse which favours Western Imperialism, a clearly defined Other, to enable a codification of the Self as its converse, and an attempt to provide an ‘authentic’ depiction of the East. The political tensions between Vienna and the Ottoman Empire, however, mean that Die Entführung is less an ‘assumption to power’ than a reaction to the current threat of an equal, albeit temporarily sedated, enemy. Self and Other were too similar in real life, and overlap too much in the opera, to facilitate a clear distinction. Far from attempting a quasi-ethnographic authenticity, in his reliance on stereotypes and musical convention, Mozart makes no such claim and, owing to the theatrical and often comic nature of the work, it would be foolish to take all its implications at face value. The absence of an internal ideological consistency means that the opera, as a self-contained unit, cannot be interpreted as uniformly Orientalist in a Saidean sense. Moreover, as with any artwork which is sent into the public domain, the multiplicity of possible interpretations by audiences existing in different times, places and cultures, force one to admit that, even if a work were deemed Orientalist according to Said’s doctrines, this could never be a permanently unequivocal designation.